HAVANA -- Pope Francis and Fidel Castro, the man who transformed his country through decades of Communism, met on Sunday at the revolutionary leader's home shortly after the pope told tens of thousands of Cubans to focus their lives on service to others instead of ideology. Follow continuing updates from ABC News as Pope Francis visits Cuba and the United States. Papal spokesman Federico Lombardi said during the conversation, Fidel wanted to reflect on big issues and questions facing the world and humanity. Francis' recent encyclical on the environment and the global economic system was discussed. Lombardi said that the 2012 visit of Benedict XVI, when Fidel peppered him with questions, the meeting with Francis was more of a conversation. Lombardi said that out of respect for the family and the informality of the encounter, no photographs would be released. He said that the decision to not release any images had been taken during the discussions with Cuban authorities to set up the meeting. Hours before the meeting, believers and non-believers alike streamed into the square before dawn for Francis' Mass, and they erupted in cheers when history's first Latin American pope spun through the crowd in his open-sided popemobile. Francis didn't disappoint, winding his way slowly through the masses and stopping to kiss children held up to him. 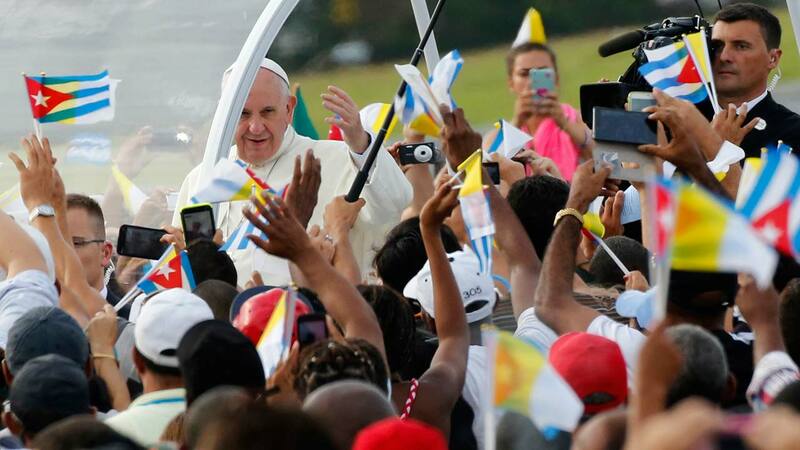 Pope Francis comes to America next week to kick off his long awaited tour of the east coast. While most Cubans are nominally Catholic, fewer than 10 percent practice their faith. The crowd was not as big as when St. John Paul II became the first pope to visit the island in 1998, but it drew people who seemed to genuinely want to be there and listen to Francis' message. "This is very important for us," said Mauren Gomez, 40, who travelled some 250 kilometers (155 miles) from Villa Clara to Havana by bus, spending her time reciting the Rosary. In his homily delivered under the gaze of the plaza's iconic metal portrait of Che Guevara, Francis urged Cubans to care for one another out of a sense of service, not ideology. He encouraged them to refrain from judging one another by "looking to one side or the other to see what our neighbor is doing or not doing." "Whoever wishes to be great must serve others, not be served by others," he said, explaining that, "Service is never ideological, for we do not serve ideas, we serve people." Francis exhorted the faithful to "to learn to see Jesus in every person bent low on the path of life, in all our brothers and sisters who hunger or thirst, who are naked or in prison or sick." Pope Francis is making his first-ever visit to the United States, September 22-27, 2015. He will be participating in events in Washington D.C. and New York before heading to Philadelphia for the World Meeting of Families. Many Cubans complain about the rigidity of Cuba's system in which nearly every aspect of life is controlled by the government, from cultural institutions to block-level neighborhood watch committees. Cubans can be excluded or lose benefits if they are perceived as being disloyal or unfaithful to the principles of the revolution. Many Cubans are also increasingly concerned about a growing inequality in the communist island, in which those with access to foreign capital live lives of relative luxury while others can barely feed themselves, generating jealousy and division within families and society at large. "Being a Christian entails promoting the dignity of our brothers and sisters, fighting for it, living for it," Francis told the crowd. "That is why Christians are constantly called to set aside their own wishes and desires, their pursuit of power, and to look instead to those who are most vulnerable." Maria Regla Gonzlez, a 57-year-old teacher, said she appreciated Francis' message of reconciliation and unity for all Cubans, and said Francis was particularly able to convey it given he is Latin American and speaks their language. Francis was finishing the day with an evening vespers service in the San Cristobal cathedral and a meeting with Cuban young people. In an important aside, Francis ended the Mass with an appeal for Colombia's government and rebels, who have been holding peace talks in Havana for over two years, to put an end to South America's longest-running armed conflict. The appeal followed the historic call he issued to Presidents Barack Obama and Cuban President Raul Castro to end their half-century of estrangement that resulted in the restoration of diplomatic relations this summer. Since then, the two leaders have reopened embassies in each other's countries, held a personal meeting, had at least two phone calls and launched a process aimed at normalizing ties in fields ranging from trade to tourism to telecommunications. Jose Rafael Velazquez, a 54-year-old worker, arrived with his wife at the plaza three hours before Mass began. He said he isn't religious, but came more out of curiosity to witness a historic event. "We also are very hopeful for this visit, because the pope was key in the deal with the United States," he said. "Ever since the announcement, there have been changes and this visit gives me more hope that it'll get better." The Vatican has long opposed the U.S. trade embargo on the grounds that it hurts ordinary Cubans most, and is clearly hopeful that detente will eventually lead to a lifting of sanctions. But only the U.S. Congress can remove the embargo. Francis will visit Congress next week at the start of the U.S. leg of his trip, but it's not known if he will raise the issue there. Cecilia Villalejo, a 69-year-old retiree, was nearly brought to tears with the final hymn of the Mass, saying the Cuban people desperately need a message of hope to have the strength to carry on. "I feel very sad; I've got all my family in the United States, especially my son whom I haven't seen for 15 years," she said. "And I'm sad because in reality, I don't think much will come of all this." 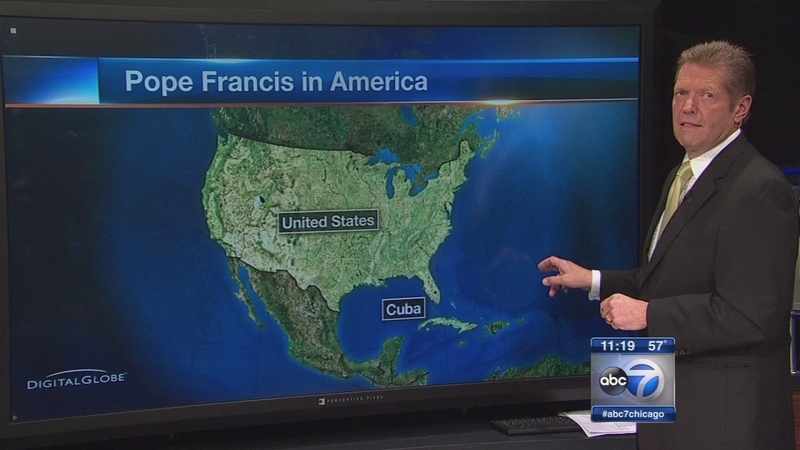 Stay with ABC7 Eyewitness News for continuing coverage of Pope Francis' visit to the United States. Alan Krashesky and Tanja Babich will be reporting live from all three cities starting Monday.